Broken water pipes can be caused by a number of issues. Once you’ve turned off the water, the first step is to locate the source of the problem. In many cases, the issue may be a broken section of pipe that simply needs repair or replacement. Master Plumbing & Mechanical will start with a thorough diagnosis of the situation. While a stream of water coming through your foundation wall or flowing down the road in front of your house may be an obvious sign of a break, there are other signs to watch for. An inconvenient drop of water pressure in your home or a hissing sound coming from the area near your water line are also clear indicators of a possible broken pipe. Keep in mind, water will find the weakest point in the ground or foundation wall and flow toward it. As soon as you detect water where it does not belong, call Master Plumbing & Mechanical for a diagnosis. 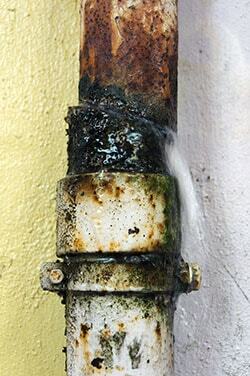 Normal wear and tear is the most common cause of water pipe breaks. The average lifetime of a water main is just 60 years, though some pipes will last longer and others will die sooner. When pipe durability isn’t the answer, we look perform diagnostics to determine the cause. We start by determining some basic information about your home that may explain a broken water pipe. How old are the interior and exterior pipes for your home and what are they made of? Have you had any symptoms with water flow, such as decreased pressure? We will perform a meter test or pressure test to determine if leak is present. We will take into account the composition, age and previous repairs of the broken water line before recommending a course of action. If sections of a pipe can be replaced or repaired in place, this will likely be your most cost-effective solution. If the cause of the break is deteriorating pipe material, it may make more sense in the long term to completely replace some sections with a more modern, durable plumbing type. Often times, if water pipes are breaking regularly, it’s less expensive to replace the plumbing entirely than to correct issues one at a time. Whatever course of action we recommend, you’ll receive a fair estimate and a detailed outline of our proposed fix. Master Plumbing & Mechanical services the Washington, D.C. metropolitan area. If you’re experiencing a broken water pipe, contact us right away for a fast diagnosis and solution.